Giorgio Vasari (1511-1574) was a painter, architect and writer. Mannerist artist, he was active as a painter and especially as an architect, in several Italian cities (Arezzo, Bologna, Naples, Rome). The name of Vasari is linked especially to large public commissions of the Medici family in Florence and the collection of the Lives, published the first time in 1550 (Lives of the Most Excellent Painters Sculptors Architects from Cimabue up to our times), which constitute the first modern work of art history. Born in Arezzo, Giorgio Vasari studied in Florence with Andrea del Sarto and Baccio Bandinelli, met Michelangelo and was introduced to the circle of the Medici court. Important part of its complex formation were also his trips to Rome (1532 and 1538). His early works are in Arezzo: various paintings for churches in the city. His first commission for a Florentine church was the Allegory of the Immaculate Conception (1541, church of SS. Apostoli). In Rome he was successfully introduced in the circle of Cardinal Alessandro Farnese, for which he decorated (1546) the room of the Chancellory. In these years he was in close contact with Michelangelo, whose influence is evident in his works. Giorgio Vasari had a hard time being accepted by the Medici. For long years he proposed himself for various works, but the competition was fierce, and the Medici had an abundance of painters, sculptors and architects already, like Bartolomeo Ammannati, Benvenuto Cellini, Bronzino, Baccio Bandinelli. 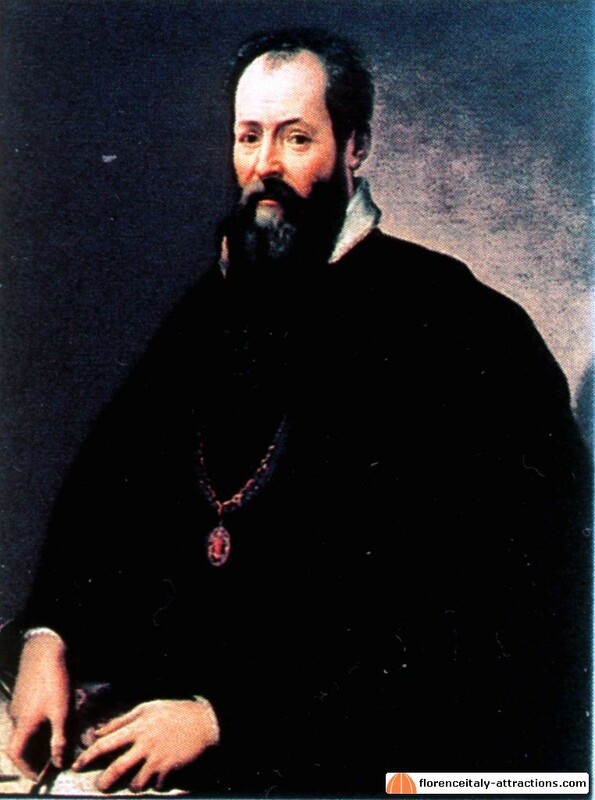 Giorgio Vasari is actually remembered as the favorite artist of Cosimo I de Medici Grand Duke of Tuscany, but their relation started only in 1554 when, finally, Cosimo called Vasari in Florence. After some tests, Cosimo was really amazed at how fast Giorgio Vasari was in completing his jobs and this was extremely important for the first grand Duke of Tuscany, anxious to show his greatness and frustrated by the repeated refusals by Michelangelo to come back to Florence. In the following years Giorgio Vasari was in the center of the major artistic events of the city. With various collaborators Giorgio Vasari worked on the decoration of Palazzo Vecchio starting with the Quarter of the Elements and then moving to the Guest rooms, the Hall of the 500 and the Studiolo of Francesco I. In 1560 he began the construction of the Uffizi, home to the offices of thirteen magistrates; conceived as a spatial connection between Piazza della Signoria and the river, the building is marked by a horizontal three-way division, which highlights the characteristics of axial and symmetry. His activity for the Medici didn’t prevent him to work on private commissions and extensive renovation of medieval churches like Santa Maria Novella and Santa Croce. Giorgio Vasari played an important role in the founding of the Academy of Arts of Design (1563) and was a collector of drawings by Italian masters. Despite all these commissions, in 1565 the architect completed, in just four months, the Vasari Corridor, connecting Palazzo Vecchio to the Pitti Palace, the new residence of the Grand Dukes. His Lives, initially written in 1550 and dedicated to Cosimo I (a way to be called at his court) are a fundamental work in the history of Italian art, in which Vasari developed the concept of the progress and the “rebirth” (Renaissance) of arts through three ages, which mark the end of the Middle Ages, the start in the modern age by the recovery of the ancient, and full maturity, expressed in the work of Michelangelo. A second, more complete edition was published in 1568. Giorgio Vasari died in 1574, incidentally in the same year as Cosimo de Medici. When he died, he was working to another great commission: the final judgement fresco inside Brunelleschi’s Dome in Florence Duomo. The largest fresco in the World was later finished by Federico Zuccari. Giorgio Vasari is buried in Arezzo, his own city.